On May 24, 1865, a young Union officer, Lt. Colonel John Craven, walked into Jefferson Davis' cell at Fort Monroe and began a medical evaluation of the new prisoner. What he saw was a sad sight. "I'm Dr. Craven," he said introducing himself, "I've been assigned to your case." Davis, almost too sick to answer, responded, "I fear doctor, you will have a troublesome and unsatisfactory patient." Studying his face carefully, Dr. Craven was far from convinced. During the initial visit Dr. Craven noticed a large and beautiful pipe belonging to the patient. It was obvious the pipe had not been lit for some time. Sensing that Davis could be suffering from tobacco withdrawal, Dr. Craven immediately sent his assistant to find a stash of tobacco. Surprised at the humane gesture, Davis gratefully lit his pipe commenting, "This is a noble medicine. I hardly expected to receive it. And, I'll have to admit the deprivation has been severe." Along with tobacco withdrawal, Jefferson Davis was also afflicted with erysipelas, severe headaches, neuralgia, an ulcerated cornea of the eye and dyspepsia. Worse yet, Davis was literally sick with worry. Day and night he wondered, "Where had the Union Army taken his wife and children? Would they be allowed to communicate with him? Would he ever see them again? Would he die in prison before they could be reunited?" 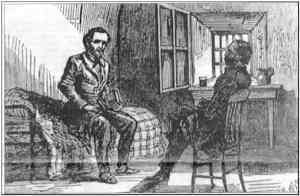 Since Davis suffered greatly with digestive problems, he refused jail rations. Knowing his patient would die without proper nourishment, Dr. Craven prepared and brought food from his personal quarters. Instead of jail rations, Craven treated his patient to tea and toast. To his delight, Davis accepted the change of diet gratefully. During one of these morning visits over tea, toast and eggs, Dr. Craven announced that his young daughter, Anna, had asked that she be allowed to prepare his meals. Davis was moved to tears. He picked up an Episcopal Prayer Book and said, "Doctor, my wife gave me this. Pray, present this with my love and grateful regards to your little Anna and say - though I may never have the opportunity to thank her myself - that my children will find her one day and call her blessed." As Jefferson Davis struggled to regain his strength, Mrs. Davis became desperate for knowledge of her husband and his health. Conditions of Jefferson Davis' confinement forbade them from having any contact with one another. It came as a surprise to Dr. Craven when a letter, postmarked Savannah, Georgia, arrived from Mrs. Davis. She pleaded for some news. "Would it trouble you too much to tell me how he sleeps - how his eyes look - are they inflamed? Does he eat anything? I plead with you upon the supposition of this man who no longer has the power to do anything but bear what is inflicted "
Dr. Craven placed the many letters he received from Mrs. Davis in his diary - for safekeeping but never responded. He continued to treat the Confederate patient to the best of his ability but remained mute to the outside world. Regarding the character and strength of Jefferson Davis, Dr. Craven commented, "No patient has ever crossed my path who, suffering so much himself, appeared to feel so warmly and tenderly for others. Sickness, as a general rule, is sadly selfish; its own pains and infirmities occupying too much of its thoughts. Mr. Davis is clearly an exception to the rule. Mr. Davis was the model patient of my practice. He seemed to regard the doctor as captain of the patient's health and obeyed every direction, however irksome, disagreeable, or painful with military exactness." Christmas Day of 1865, was a sad occasion for both men. Dr. Craven was dismissed from Fort Monroe because he had become too friendly with the patient. 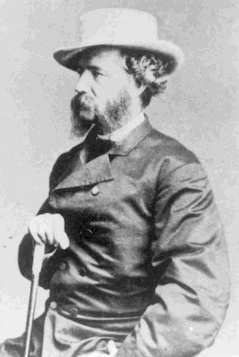 General Nelson Miles, commander of the Fort, had previously ordered Dr. Craven to restrict his conversations to professional topics only. Dr. Craven resisted and as a result was removed from his post. But, the kind doctor was far from defeated. He left Fort Monroe carrying with him the diary he had kept while treating Davis. The diary contained medical information as well as all the personal conversations the men had shared. Within months, the Carleton Publishing Firm in New York, released Dr. Craven's book, The Prison Life of Jefferson Davis. The contents shocked the nation. Page after page of entries revealed how General Miles had mistreated the Confederate prisoner. He had placed him unnecessarily in iron shackles, fed him food not fit for human consumption, kept him in a musty and damp cell, and, worst of all, forbidden him to have contact with his wife and children. Northerners as well as Southerners were outraged by the atrocities. The book caused such a national sensation that General Miles was fired. The Union doctor had managed to swing the tide of public opinion. Instead of his Confederate patient facing years of imprisonment, it was now possible that Davis would be released from prison and reunited with his family. And, within another years' time, he was. Along with the diary, Dr. Craven left Fort Monroe with one other treasure: Jefferson Davis' pipe. During their parting moments, Davis presented him with the gift of his pipe. "I want you to have this," Davis said sincerely, "Other than my prayers, it's the only thing I have left to offer." Editor's note: The Prison Life of Jefferson Davis only covered the first seven months of Davis' imprisonment (May 24 - December 25, 1865). Dr. Craven was replaced by another Union doctor, General Burton, who also became Davis' friend and gave him freedom of the fort. General Miles spend the rest of his life trying to defend his harsh and inhumane treatment Jefferson Davis. Until the day of her death, Mrs. Davis made sure that the vile acts Miles committed against her husband were never forgiven or forgotten. Dr. Craven's book is still in print and may be purchased at the Vicksburg National Military Park Visitor's Center.